The one ball is typically the ball at the head of the rack hit upon the break. 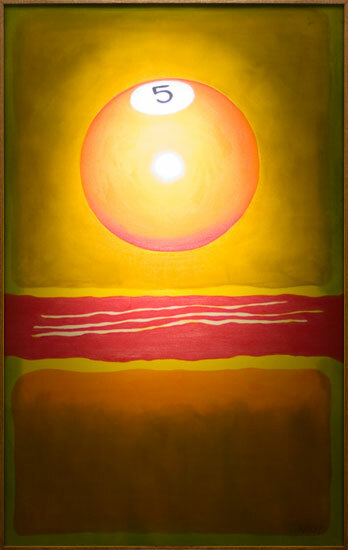 Color and composition were influenced by Andy Warhol and Robert Indiana, two significant Pop artists of the 1960’s. 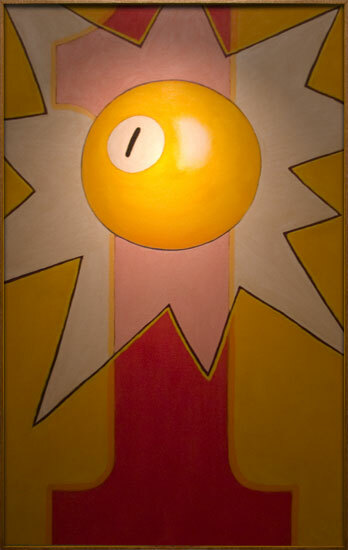 The Pop artists made use of everyday objects in their art such as Campbell soup cans, numbers and cartoons. 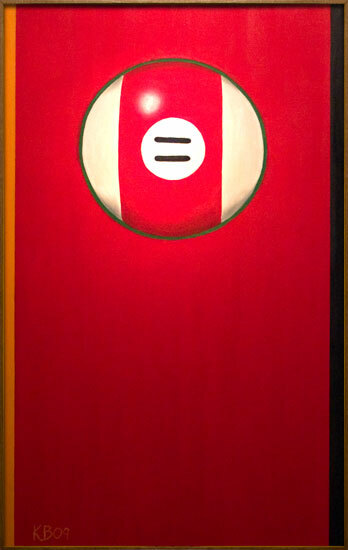 This painting has that “POW” quality found in Pop paintings…. and the popular BATMAN tv show. The number “2” brings to mind a pair, deuces, two of a kind, the second ball. It was with these ideas this painting came to be. 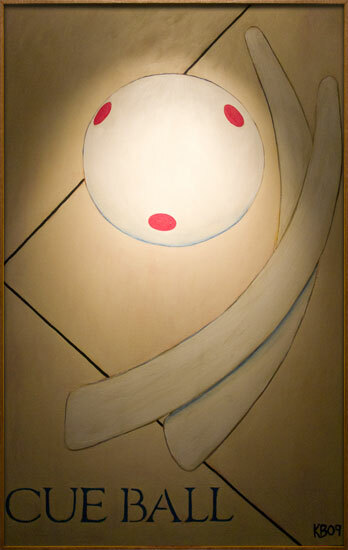 This painting also gave me the opportunity to handle the paint in a loose and expressive spirit. 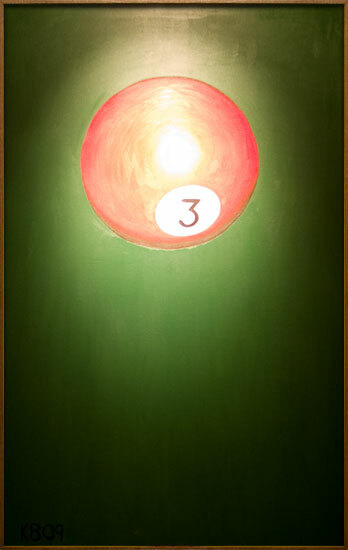 The 3 Ball being red and the felt on a pool table often being its complement green, lead to the development of this economically painted color field painting. I was automatically attracted to these two colors and felt these colors were all that was needed to celebrate the game and color. Paintings are basically made up of colored marks. I see myself as a mark maker. I enjoy coloring and making marks. This painting gave me the opportunity to paint marks. The marks below the 4 Ball show the evolution of the glyph, the number 4, and how it has come to be written. This painting was painted using the basic composition and color of the Abstract Expressionist artist Mark Rothko’s painting No. 5/22. Although Rothko was interested in pure form, he did not want his pictures seen only for their formal qualities. Rothko said of his painting No. 5/22, “If you are only moved by color relationships, then you miss the point. I’m interested in expressing the big emotions—tragedy, ecstasy, doom,” all emotions one confronts playing pool! 666 is symbolic of the anti-Christ. The marks below the 6 Ball are thought to be the name of the anti-Christ. From the earliest known record of the Book of Revelations, scholars believe this to be the name of the Beast. 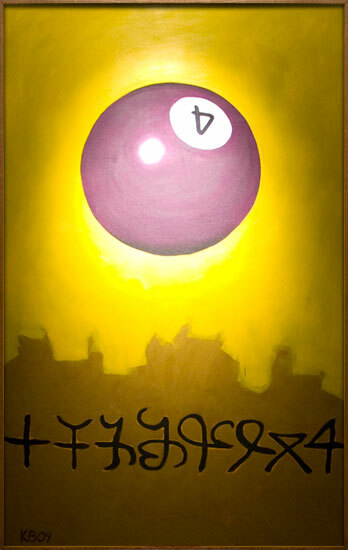 This painting was created using the idea of the “Lucky No. 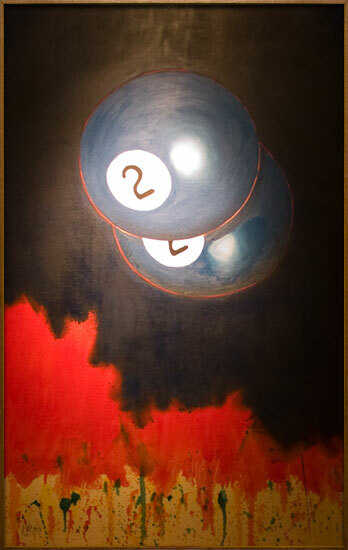 7.” One often finds this term related to gambling, something that often takes place on a billiards table. 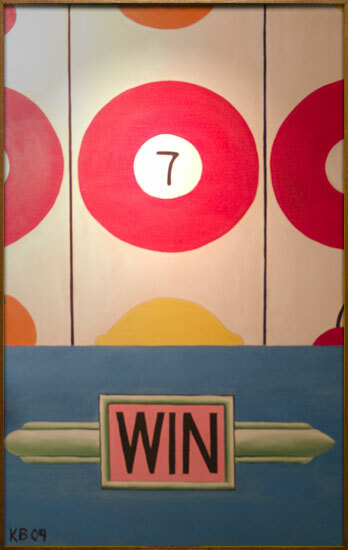 Here it is depicted as the winning sequence of numbers found on a slot machine. 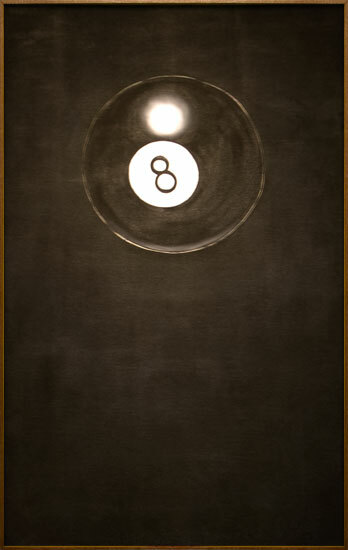 The eight ball carries a lot of significance. It is of course the winning ball in the game Eight Ball. There is also the Magic Eight Ball you ask questions. 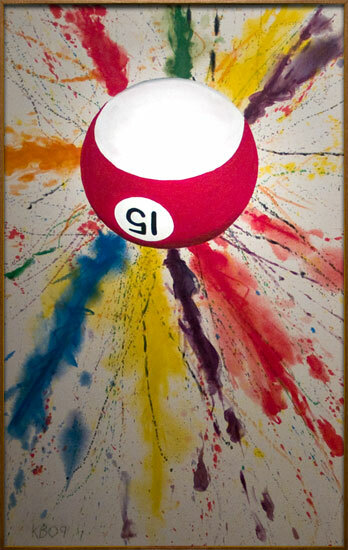 I painted this painting using a variety of colors, giving it some depth and attempting to capture that “magic” of the eight ball. 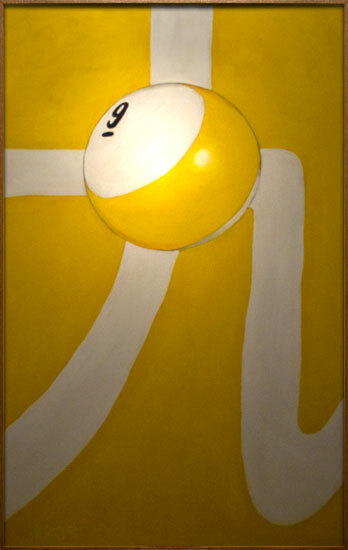 Behind the 9 Ball is the Chinese character for the number 9. 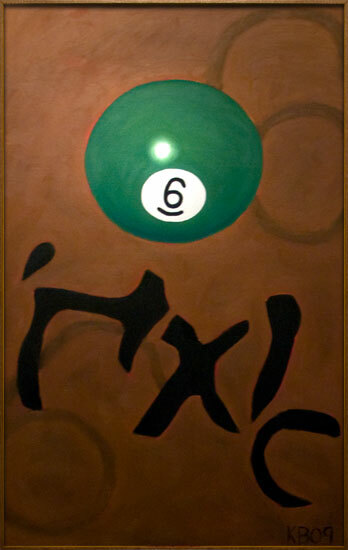 In Chinese this character also stands for “Good Luck,” something one always hopes to have when playing a game of 9 Ball. 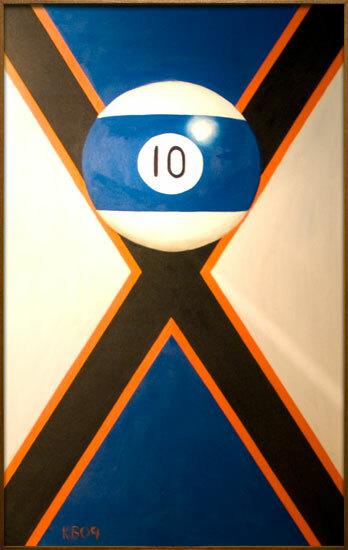 The Roman Numeral X was used in creating this painting also signifying, “X marks the spot” or the object ball in the game of 10 Ball. There are twelve colors on the color wheel. These colors are derived by mixing primary and secondary colors. The resulting colors are called tertiary colors such as blue-green, red violet and yellow-orange. The number 13 is considered the number between light and dark. It is characterized as an unlucky number. 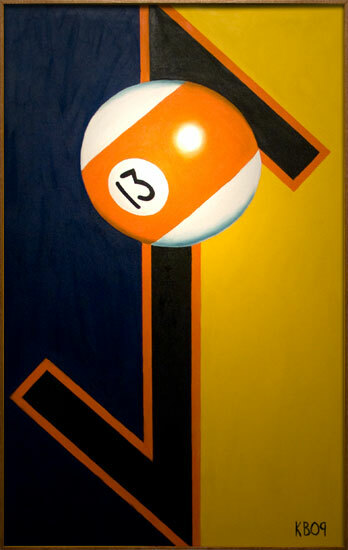 Behind the 13 Ball is the “rune” symbolizing the number 13. A rune is an early Germanic language inscription used before the adoption of the Latin alphabet. The use of the rune for 13 was later discontinued because of its unlucky quality. 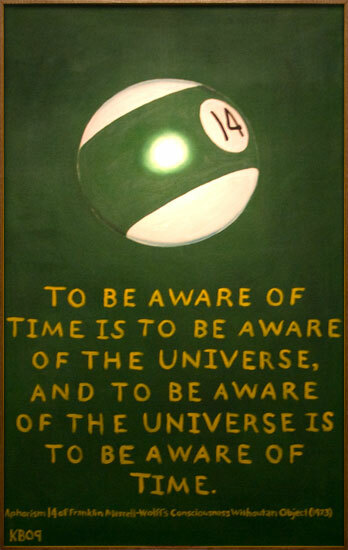 This painting includes the 14th Aphorism of Franklin Merrell-Wolff, a transcendental philosopher. This Aphorism for me sums up the game of pool. 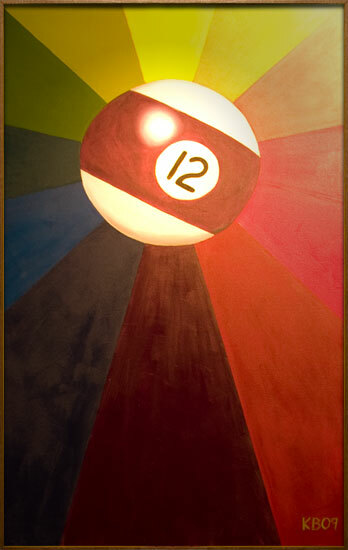 This painting was done to celebrate billiards, painting and the completion of “The Rack,” this series of paintings.